Join Our Friends from Pixar, DreamWorks, and Tippett! We’re ALL about helping you pursue your animation dream. It starts by learning face-to-face from the same professionals who bring our favorite characters to life. And we want to make it affordable and accessible. That’s WHO we are … and now you can check out the full Animation Mentor experience during our ALL-DAY animation workshop! 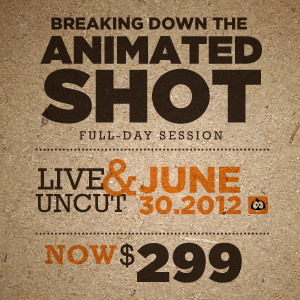 Best of all … the registration fee for our upcoming live event is now $299! Our professional animator friends will be there … pros like Victor Navone from Pixar Animation Studios; Peer Lemmers, Robyne Powell, and Sean Sexton from DreamWorks Animation; and Will Groebe and Chris Mullins from Tippett Studio! Our friends will take you behind the scenes with their shot breakdowns and share studio feedback and director notes from current and past animated features, including Madagascar 3: Europe's Most Wanted, Puss in Boots, How to Train Your Dragon, Legend of the Boneknapper Dragon, Toy Story 3, and Monsters vs. Aliens! We are kicking it with Autodesk. They will sponsor the event and share their expertise with a working Maya® demo! All this plus lunch, some cool giveaways, and the usual Animation Mentor love. Register today and let’s get ready to break it down! Thanks for sharing this health benefits I really enjoyed reading this article we are supplier of quality Generic Harvoni medicines in Chennai if you need any Resof L medicine so pls visit us. I’m not sure why but I think its a linking issue. thank you so much for share. I will right away seize your rss as I can't find your scr888 email subscription hyperlink or e-newsletter service. Do you have any? Kindly allow me realize so that I may just subscribe. Thanks.